Don’t you hate when this happens? 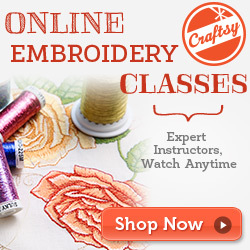 You are doing an embroidery design, or a monogram, or even an applique and your thread “loops” up on you. I’ve struggled forever with this and what causes it. There have been times where I’ve totally blamed the spool of thread. It was a bad spool or the thread was not twisting off the spool correctly. Recently I did some knit toboggan hats and my monogram looped on every.single.one.of.them. I emailed my sewing machine guy and he said it was a density issue. 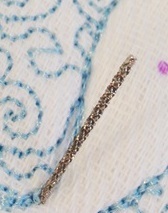 For example, knit hats + dense monogram = the thread/needle does not penetrate the knit properly and therefore loops. Sometimes I think my machine is dusty or dirty, so I change all my needles and clean the bobbin area to get rid of any dust or pieces of thread. 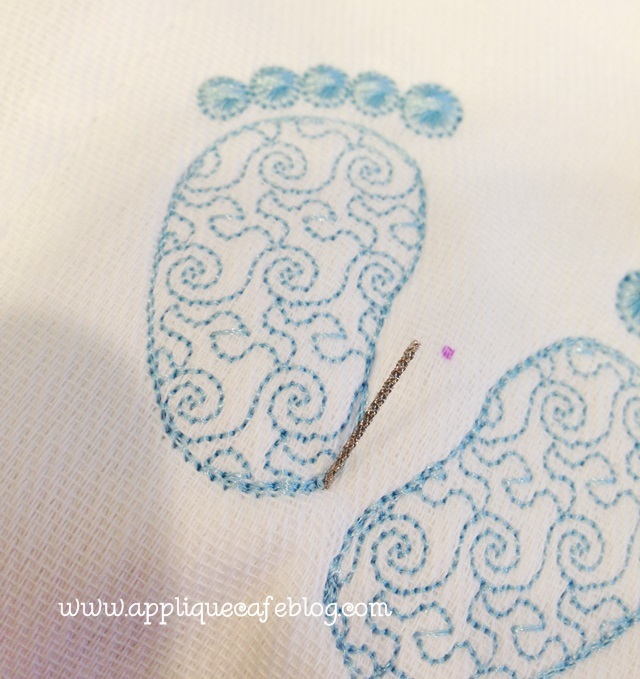 Below is a “Footprint” embroidery design I’ve recently sewn on 3 dozen burp cloths for a local ministry, Footprints Ministry. As you can see by my arrows on the photo below, the thread looped up on me in one spot. If this happens, don’t cut it! That may cause your design to unravel. 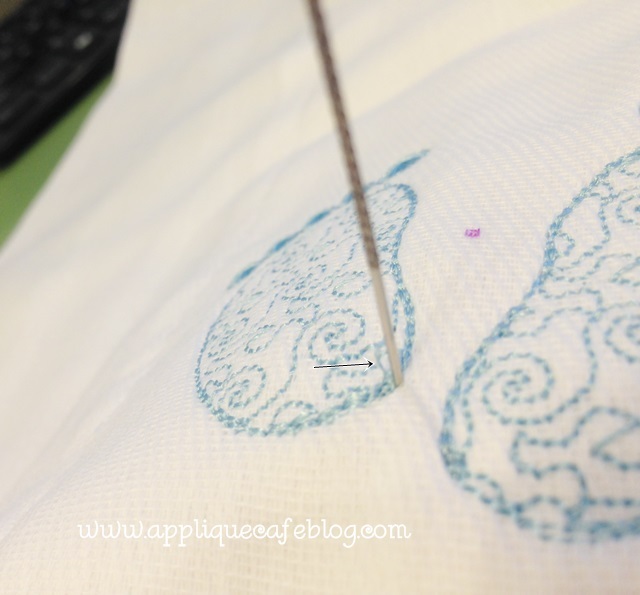 What I USED to do was stick a regular needle or straight pin through and then try to pull the thread to the back by pulling on my bobbin thread in that area with a needle. It worked most of the time. 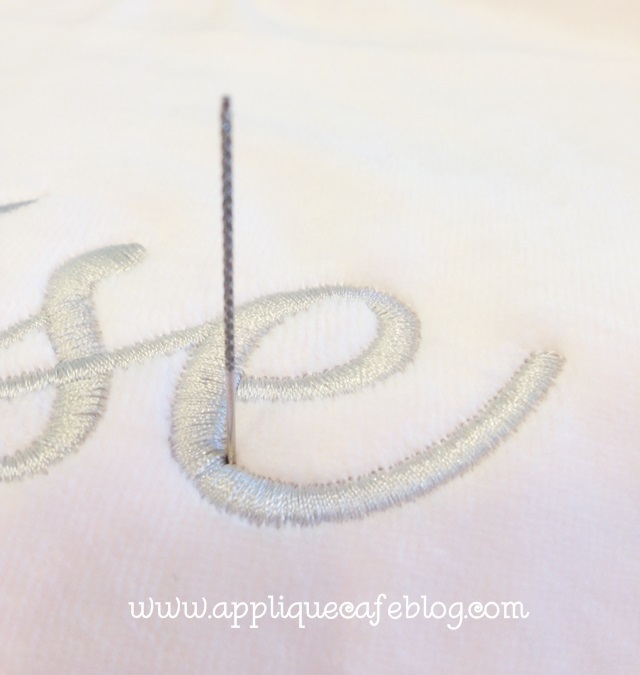 Now if your monogram loops terribly and you’re looking at 15 places where the thread is loopy, then you might need to remove the monogram and back up and sew it again. But, if it’s just a loop here & there, I have a great tool for you. 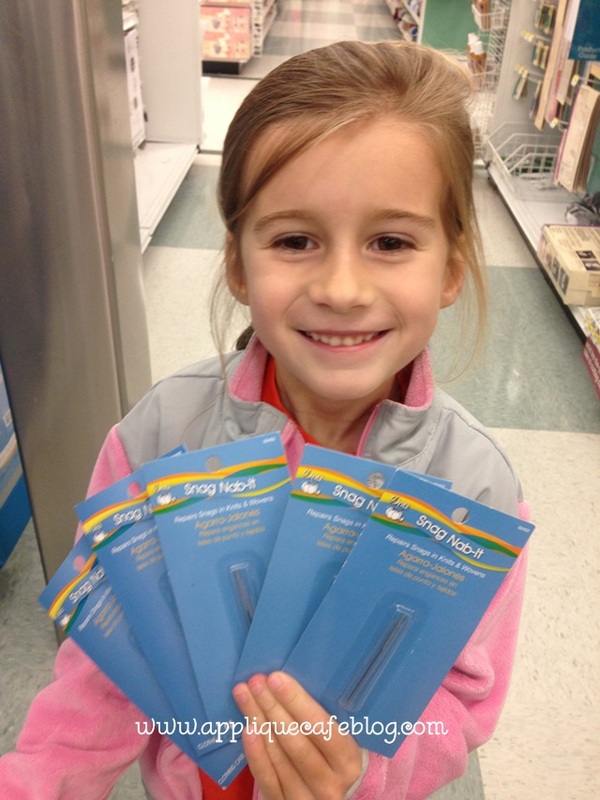 It even has a cute name ~ Dritz brand Snag Nab-It!! I got mine at Joann and it looks like this. It’s basically a needle (just shy of 2.5″ long) with 1 sharp end and the other end resembles an emery board. It’s jagged like sandpaper. 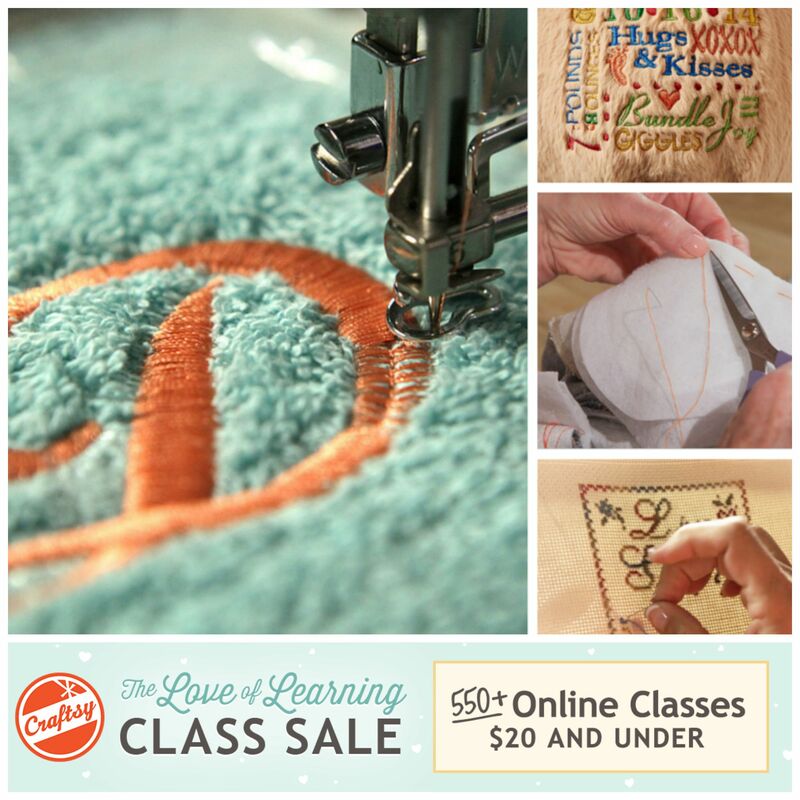 They are $2.99 and are considered Notions, so catch them on sale or use a coupon. I also found some on Amazon. So here’s how it works! 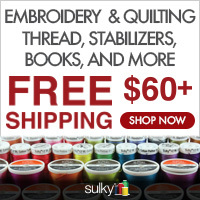 You stick the Snag Nab-It in to your garment where the loop starts or finishes. You may notice the needle is pretty thick, so it can be a little tough to pull the needle all the way through (especially pulling the jagged end through). If it leaves a hole, then spritz a little water on your garment and it should be fine. 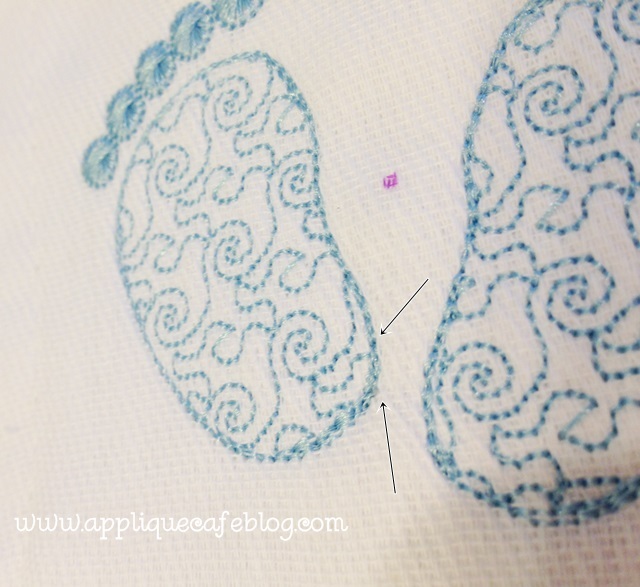 As you pull the needle through, the rough end grabs the loose thread and pulls it through to the back of your item (back there with the bobbin thread). You could then apply a little Fray Check on the back of the item or leave it as is. The thread would have to be pulled to come back through to the top which is unlikely. Here’s a closeup of the end. As you can see below, the loop is gone! I successfully pulled it through the burp cloth to the back of the design. Yay! Here is another example! I monogrammed this bib today and the thread I was using is an off-brand thread that I never use. As you can see, it didn’t “loop” too terribly bad, but the monogram is not as tight as I would like. Again, I stuck the Snag Nab-It through the bib where the loose thread was (on the very edge of the satin stitch) and pulled it through. 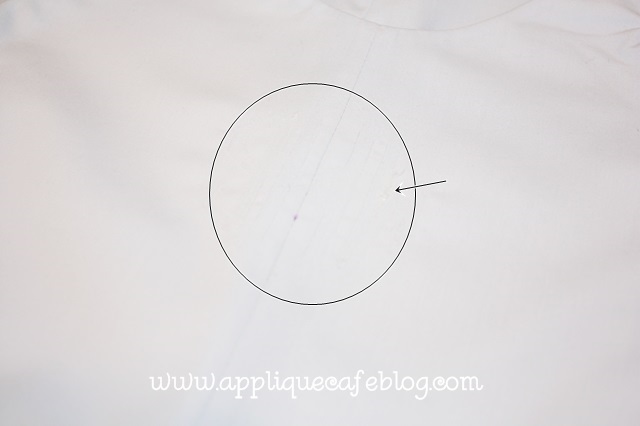 As you can see, it tightened that loose thread by pulling it through to the back side of the bib. Ironing also helps “set” the monogram. I keep my iron on medium heat, no steam. I have heard that rayon thread can melt, but I use 100% polyester embroidery thread so ironing it quickly only “sets” the monogram. 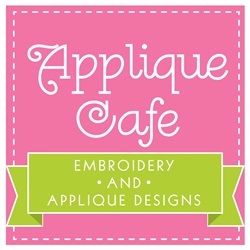 I typically use Isacord (www.sewingmachine.com) or Exquisite thread (www.kenssewingcenter.com) which are almost identical. Hopefully this helps with that frustrating looping problem! Do you have any other cool tools you use? If so comment and share! Just a quick post this Sunday! One of my longtime customers brought me a little jon jon last week and asked me to cover up the monogram that was originally on there (that she had picked out). The photo below is very light so you may not be able to see it all that well. She did a good job of removing the old monogram, but did cut the jon jon in one tiny place. She patched it, so I just needed to cover the monogram with an applique as best as I could. 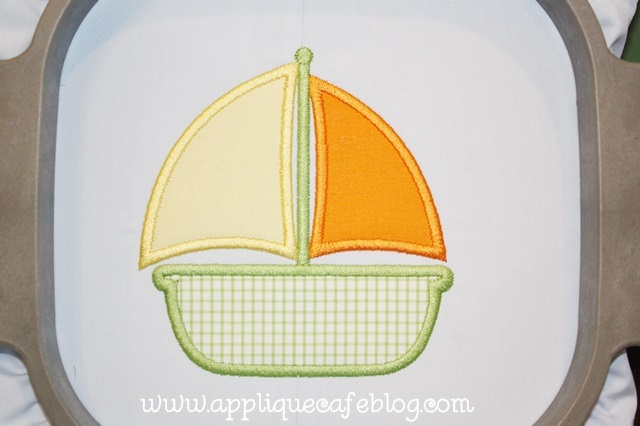 Her suggestions: our Sailboat or Sailboat Patch (I chose Sailboat 2) or our circle patch with new initials. All good choices! 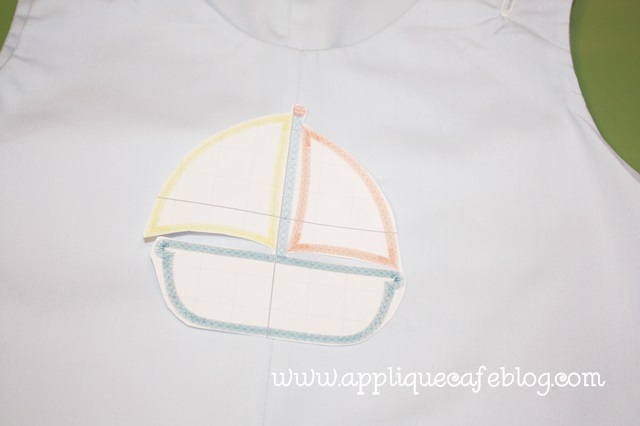 I decided to give our Sailboat 2 a try, and to make sure it would cover the monogram, I printed the 4×4 design on paper in Sew What Pro using the PRINT feature. 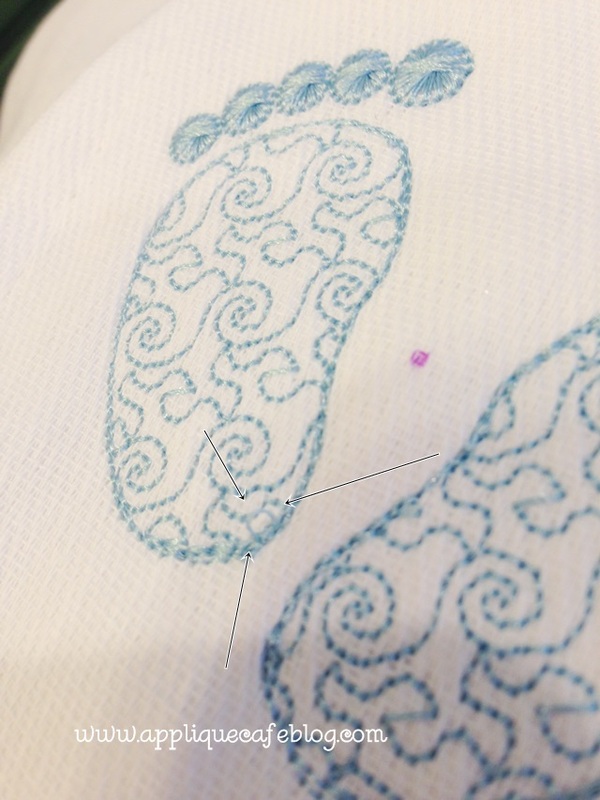 It basically prints an image of each step and a final stitchout of the design. 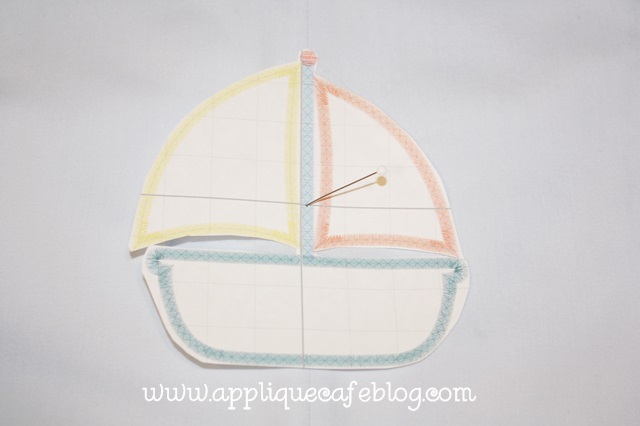 I cut around the design and even in between the sails and the bottom of the boat. 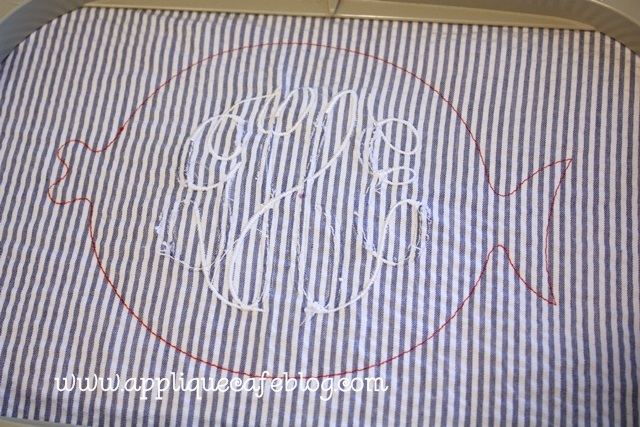 I was then able to place the “design” on to the jon jon and SEE if any of the old monogram would show through. It covered it pretty well, and I got the design in the right position to cover up the monogram while being centered on the jon jon. The jon jon had a center seam going down the front of it, so I used that as my horizontal center. It turned out perfect, and the monogram was covered! 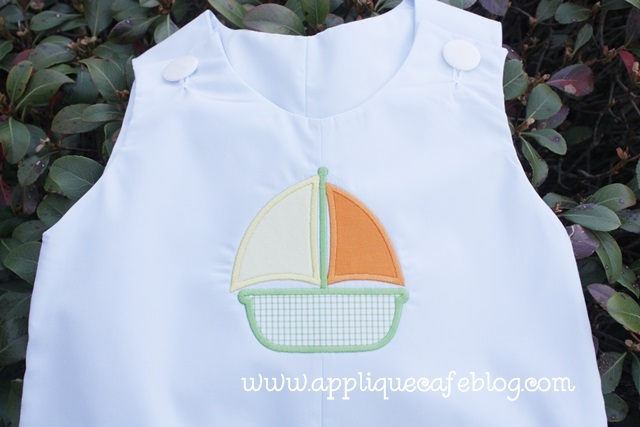 My customer has 3 grandsons, so it’s great to be able to re-use custom made outfits such as this! 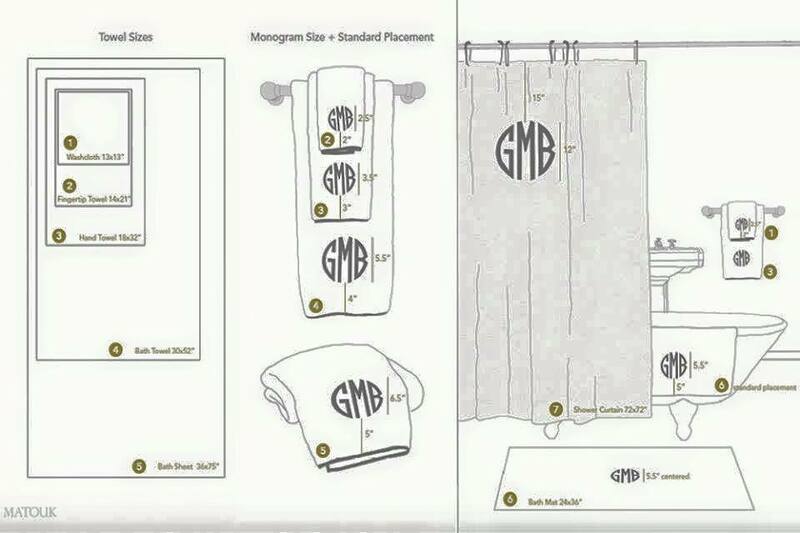 Here is another blog post on covering a monogram: click HERE or on the photo below! Sometimes you are able to remove an old monogram cleanly and just re-monogram over it. 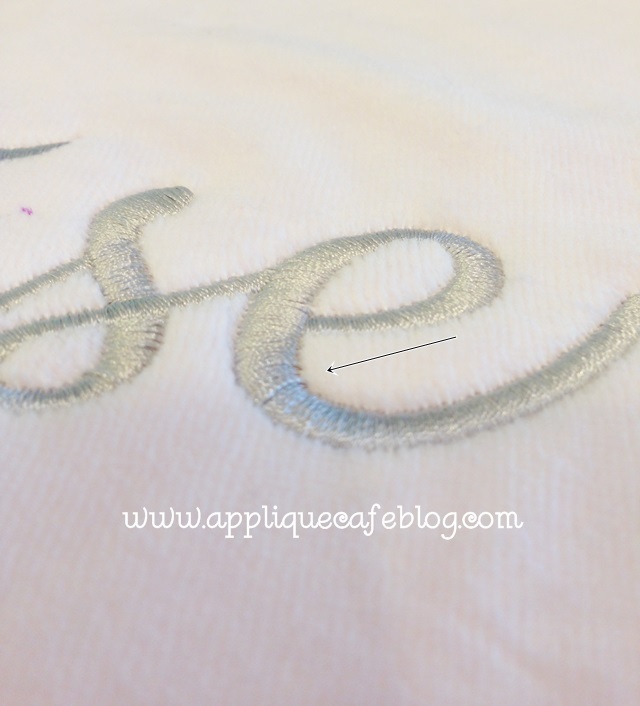 If the monogram is too small or tight and impossible to remove (or if you cut a hole in the garment like I’ve done many times), then I suggest you take out what you can, and cover it with an applique! 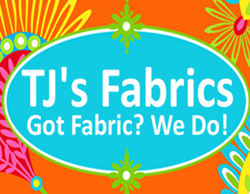 We have tons of PATCH designs that work well. Stay tuned for my next post on a new discovery I found!! 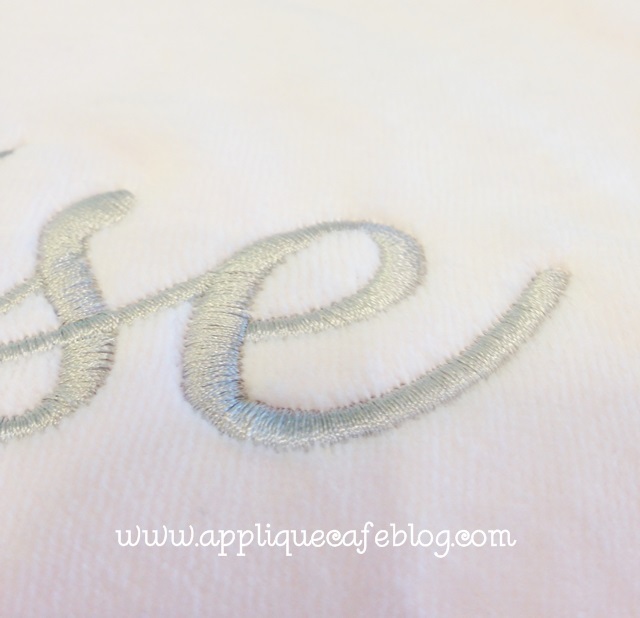 If your monograms or appliques get “loopy” every now & then, you will want to read the next post!